ALavandhAr says “Even when you abandon me disregarding the adverse impact on your own greatness, I will not give up on you” and manifests his mahA viSvAsam (unshakeable faith) which is a result of his agathithva (lack of any other refuge). mahESa! – Oh sarvESvara (lord of all)! Oh sarvESvara (lord of all)! Even (if you) pushed (me) aside, I will not dare to let go of your divine lotus feet; [just like, even] if a nursing baby was pushed away (by the mother) out of anger, [the baby] would never like to leave the mother’s feet. 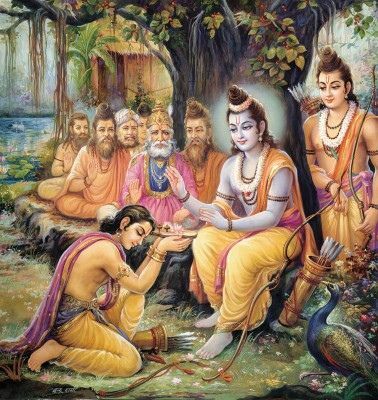 nirAsakasyApi – As protecting others is natural for your highness, there is no reason for you to refuse me; but if such you, mercilessly refuse me. thava pAdha pankajam thAvath hAthum na uthsahE – I do not have the confidence to live giving up your divine feet which are my protection, apt for me and enjoyable. As said in perumAL thirumozhi 5.2 “kaNdAr igazhvanavE kAdhalan thAn seydhidinum koNdALai allAl aRiyAk kulamagaL pOl” (Even if the husband insulted me in public, a chaste wife will not have faith in any one other than him), even if you fail to protect me, I have no where to go. mahESa – Oh natural lord as said in SvEthASvathara upanishath 6.7 “thamISvarANAm paramam mahESvaram” (the supreme lord of those who are considered as lords), SrI bhagavath gIthA 18.61 “ISvaras sarvabhUthAnAm” (the lord of all creatures)! Can I go and seek out upliftment in this samsAram (material realm) where relationships are acquired by one’s karma? When there is natural friendship and relationship with you as said in SrI bhagavath gIthA 5.29 “suhrudham sarvabhUthAnAm” (being the friend of all creatures) and mahAbhAratham AraNya parvam 192.56 “sarvEshAmEva lOkAnAm pithA mAthA cha mAdhava: | …” (lakshmInAtha (lord of Sri mahAlakshmi) is the father and mother of all worlds; Oh best among men! you surrender unto him who is the apt refuge) respectively, can I seek out these else where to be uplifted? sthanandhayaS SiSu: rushA nirasthO’pi – When an infant baby sustains by mother’s milk, even when the mother angrily abandons that baby, the baby has no ability to protect itself and fully depends on the mother – such stage is explained here. This AthmA is always under the protection of bhagavAn only and remains always dependent on him. perumAL thirumozhi 5.1 “arisinaththAl InRa thAy agaRRidinum maRRavaL than aruL ninaindhE azhum kuzhavi” (the infant will cry out for the mother’s mercy, even when the mother herself pushed the infant away due to anger). “InRa thAy” (mother who gave birth to the child) and “arisinam” (great anger) are virudhdha dharmam (contradictory principles) – they would not occur in the same person. Even if the father at times becomes angry for the well-being of the child, it does not happen in the case of mother [i.e., she never becomes angry, similarly, bhagavAn will never refuse any one]. jAthu – never – whether she is angry or she is affectionate. mAthuS charaNau na jihAsathi – Like, the child will hold on to the foot tightly even if the mother pushes the child away with her foot instead of her hand. This entry was posted in Other, sthOthra rathnam on January 8, 2017 by Sarathy Thothathri.